Welp, July was pretty pants in terms of reading and blogging was concerned. Only five books read, what am I doing with my life? Seriously. It was a rather interesting month though. YALC happened. The boys finished school and are out of the summer. E graduated from primary school (all the wailing from me already!) I hit an unexpected slump but I feel like hopefully it's passed. Going to YALC really inspired me so I hope that carries through to reading and blogging again. 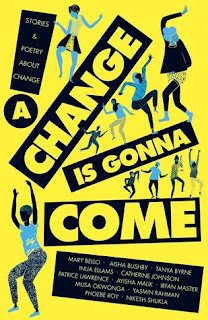 My book of the month was undoubtedly A Change Is Gonna Come, the anthology of short stories and poems written by BAME authors. Even if I'd read loads more books than I did in July this book still would have been it. This book is so amazing and important and inspirational. I love that it exists in the world and that you all can go out and buy copies and read it. Please do that. These were reviews I had written in June and had scheduled in advance. Sob, I was doing so well too. Let's hope August sees better results, eh? Yeah, nothing. There wasn't a whole lot of blogging during the month of July. Bad Michelle. So July was a month of booktube videos, apparently. It's the only section in this entire blog post I'm proud of, ha. Let's hope this continues. I have several videos that I've either recorded (and need to edit) or have written notes on and just need to film. Let's see. I have my fingers crossed though. Well seeing as how I only read 5 books in the entire month, I'd say the fact that three of them are by British authors is pretty good going. Phew. Why do I still have this as a category here? Whyyyy? It makes me feel bad every month that I'm not doing more to read my own books. Technically one book I read during July was a book I bought myself (a trashy romance book) but I don't count e-books so boo. I did request several books on Netgalley this month so I will have to do more in August to balance this out, but I'm still at a reasonable percentage and a smallish number of my books on my shelf. I feel okay. What have you been reading and loving in July?